“This ashram is a very special place. It is Vaikuntha, the abode of Lord Vishnu, and it is Kailasa, the abode of Lord Siva.” Sri Swamiji. “Sri Dattatreya is the embodiment of the harmony of all religions. It is for this reason that Swamiji has adopted Sri Dattatreya as his ideal for the spread of his religion of humanity. Sri Dattatreya was an avadhuta. He has no caste, no religion, no era. It is for this reason that the “Peetha” of Swamiji is “Datta Peetha”. Sri Swamiji’s 50th Birthday Message, 1992. “This ashram is a holy place. Divine energy permeates each and every corner of the ashram. Thousands of devotees come here, yet very few of them realize that the spiritual services of the ashram are meant for their spiritual upliftment.” Sri Swamiji’s discourse, December 2002. One only needs to see the marvelous transformation of the Mysore ashram from its humble beginnings in June 1966 to its present grandeur and glory to gain an appreciation of the multifaceted spiritual mission of H.H. Sri Ganapati Sachchidananda Swamiji. Once considered an untamed land full of snakes, ants, and shrubs it is now a vibrant, holy city with temples, shrines, schools, medical clinics, gardens, and parks with breathtaking beauty. The change that the ashram has undergone is analogous tothe transformation that Sri Swamiji catalyzes in the lives of the devotees. At the heart of the Datta Peetham is the Dattatreya Temple and Universal Prayer Hall where Sri Chakra puja is performed daily. On Sundays, Sri Swamiji performs Ganapati Homa. The major festivals of Navaratri, shivaratri, Datta Jayanti, and Sri Swamiji’s birthday are elaborately celebrated in the Nada Mantapam that accommodates huge numbers of people. On each Friday, when Sri Swamiji is in the ashram, He performs worship to Lord Datta- Venkateshwara in the exquisite Venkateshwara temple that was consecrated in 1999. Sri Swamiji is an avid proponent of the universality of all religions. To that effect, He brought forth the “Dharma Dhwaja” stupa, which depicts the essence, of Yoga, nature’s elements, and the major religions of the world. To perpetuate the Vedas, Sri Swamiji has established a Veda School that provides in- depth training in the Rig, Yajur and Sama Vedas. Devotees throughout the world clamor for Sri Swamiji’s classes in Kriya Yoga and Vedanta, and enlightening discourses such as “Ramayana Saptaha”; “Guru Gita”, “Bhagavad Gita”, “Hanuman Charitra”. And “Devi Saptaha”. Sri Swamiji’s speeches and news of ashram events are printed in the monthly Peetham journal, “Bhakti Mala” which has been published continuously since its first issue in 1976. Music flows from Sri Swamiji in such an endless stream that He is “nada” itself. 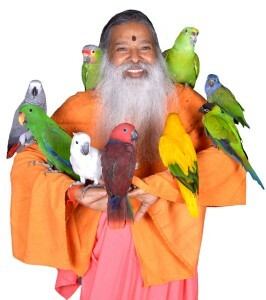 He has composed thousands of bhajans that are rich in meaning and are a delight to the ear. One only needs to listen to his powerful, melodious voice while singing bhajans or become immersed in the symphonic flow of notes from His synthesizer to experience the Divine. Sri Swamiji designed and built the Nada Mantapam as an open-air concert hall that is presided over by the Sapta Swara devatas, for the performance of His Music concerts for Meditation and Healing, as well as for music concerts by a galaxy of artists. There are numerous Peetham Trusts for social service. 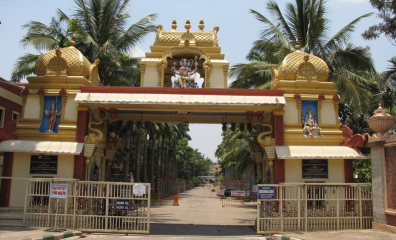 The Sri Jayalakshmi Mata Nitya Annadana Trust provides free meals to thousands of people who visit the Mysore ashram. A hospital and dispensary that provide free allopathic, ayurvedic, homeopathic, and naturopathic treatments is located within the ashram. The ashram also holds free medical camps such as cardiac screening camp, diabetes camp, orthopedic camp, and dental camp. Mobile medical clinics travel to villages surrounding Mysore City, and the ashram has donated ambulances to many towns. The Peetham also runs a high school and a primary school in Mysore city. One of the most recent projects is “Amma Vodi” which is a home for destitute women that the ashram has constructed in Hyderabad.